Musabbeh Al Kaabi is the Chief Executive Officer of Petroleum & Petrochemicals, which covers a portfolio of international assets spanning the oil and gas value chain. 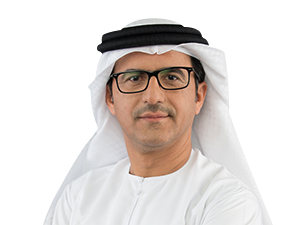 Previously Musabbeh was CEO of Mubadala Petroleum, and prior to that, he had a 16-year career with Abu Dhabi National Oil Company (ADNOC) leading the Exploration Division. Board Positions: Chairman of Mubadala Petroleum, Compania Espanola de Petroleos SA (Cepsa), an upstream oil and gas company headquartered in Spain and Vice Chairman of NOVA Chemicals, a North American based producer of plastics and chemicals. He is also a Board Member of Dolphin Energy, Cosmo Energy Holdings, an integrated oil and gas company with upstream and downstream operations based in Japan; Borealis, one of the world’s largest producer of petrochemicals headquartered in Austria.